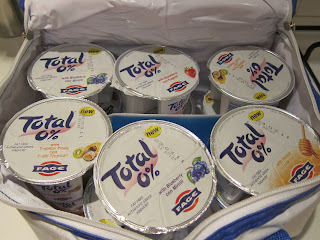 You might remember a while back I tried some new TOTAL snacking yoghurts. Well, I've finally got around to trying all of the flavours now and I can say that they are all pretty blimmin' nice, but my favourite by far is the Tropical Fruits one. These new yoghurts are 0% fat Greek (of course!) and the available flavours are Blueberry, Strawberry, Tropical Fruits and Honey. The Honey one suffers from being A. yoghurt and needing to be in the fridge but B. having honey which pretty much solidifies if you do that so you need to leave it out for a bit before trying to eat it otherwise you just end up with a hard lump of honey with a thin covering of yoghurt on it and it just won't mix in. The strawberry one is just far too sweet for my taste, but Mr TOTKat quite likes it. I really like the blueberry one, but far and away the winner for both of us is Tropical Fruits. Generally, I'd be happier if there was less sweetening added to the compote part because they're a touch on the sickly side for me, but given that the flavouring enhancers are natural - i.e. honey or sugar, I'm less concerned than I would be if it were aspartame or similar. I am a bit of an anti-sugar freak, but given how little (non-fruit based, i.e. unrefined and actually in something that it's supposed to be in from the start) sugar I actually eat I'm relatively happy to eat these, plus they're higher in protein than 'normal' yoghurts as they're Greek. Swings and roundabouts really. I'd like to see a couple more flavours in the range - black cherry (my top favourite flavour of fruit-flavoured yoghurt) and maybe rhubarb or mandarin orange and I'd like to see less added sugar. That said, I still think it's going to be handy to keep a pot or two in the fridge at work for those times I cycle in and had something else before I left the house and need a top-up when I get in to the office. Definitely more convenient than keeping a large pot of plain yoghurt and a tub of compote, in an already crowded work fridge, and not really getting through them and ending up throwing some away. And I'm all about the not wasting food (I really can't believe how much most people throw away; utterly shocking to me). I <3 these, so tasty - and I agree the tropical fruit one is best, my local supermarket always seems to have sold out of these ones so I think everyone prefers them!